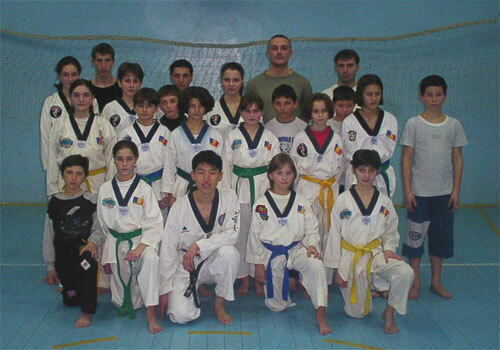 Our main task in Blaj, Romania was to write a Romanian textbook of Taekwondo, and the writer was Master Nelu while I was a helper. I supplied him with some informations about Taekwondo and accelerated his work with a digital camera I brought there. It was why I visited him in the holidays, not in the usual days when we can practice Taekwondo together more. We practiced Taekwondo only one day, after the long holidays of the new year. Before it I told Master Nelu about Samjae and Kang-Yu, the principles of Taekwondo. Owing to its economical problem they had to practice Taekwondo almost without Taekwondo materials like protectors or kicking targets usually. So I felt a little difficult to lead the Taekwondo lesson more interesting, which I consideres a little much as the class included many kids too. The photo you see here is the shot just after the training.